No matter how small it is, a garden can be a great place to spend time. There are a number of ways of improving your garden some of which will be cheap and others which will be somewhat more expensive, but all of which will help to make your garden a more pleasant place for you and your family to enjoy. If you want your garden to be a riot of colourful blossoms or a source of healthy vegetables, good fertile soil is vital. This doesn’t cost much, but it may be hard work depending on the current state of your garden. You may need to do a considerable amount of weeding, or remove topsoil that is hiding rubble to create a larger planting area. Start by digging out the weeds, as well as any tired old shrubs. Once you have done this dig in lots of well rotted organic matter such as garden compost or horse manure, and then apply an organic fertiliser such as bone, blood, and fishmeal – usually about one handful per square metre. Preferably this should be done during the winter, but if you didn’t get around to it you can still apply the fertiliser before planting in the spring. If there are already plants in the beds, apply mulch. When choosing your plants remember to consider the type of soil you have and the area in which the plant will be placed. Some plants like shady locations whilst others prefer sunnier conditions. When planting, always ensure the holes are large enough for the plants, and remember to water the new plantings frequently. You don’t, however, want to water them too frequently. Installing a flow meter device will measure exactly just how much water you’re using. It’s a no brainer for avid gardeners. You can improve the condition of your lawn in a number of ways including using natural lawn fertilisers, aerating by punching holes in the lawn at least three inches deep, watering deeply but less often, and cutting your grass to the correct height. In some circumstances artificial grass can be an excellent option for improving your garden. Artificial grass is easier to maintain than natural grass, requires no fertiliser or mowing, and if you live in an area that is prone to droughts it will keep its good looks even when there is a hose-pipe ban. Artificial grass really comes into its own when used in high wear and tear areas, roof gardens, splash-back areas of swimming pools, and dog runs since it will not die off and leave unattractive bald patches. 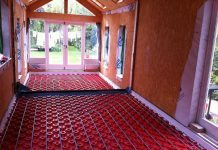 In warm weather your garden can become a true extension of your house if you install a patio or decking. A patio or deck can be used as an outdoor room, adding extra space to your home, and you can create a wonderful space with tables and chairs, lights, plants in containers, and a BBQ. In sheltered areas, trellises can be erected for grapevines which will provide excellent shade and create a glorious feeling of the Mediterranean; mixing in some scented plants such as jasmine or perfumed roses is also an excellent idea. 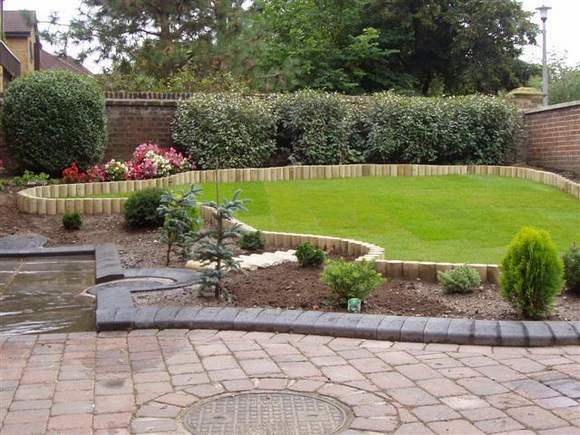 Designs for large gardens can also include water features, play-areas for children, and rockeries. Small gardens can also be fantastic; container gardening is a great way of adding colour or creating a source of tasty herbs for the kitchen. Wooden barrels, planter boxes, and hanging baskets can all be used; a number of plants such as pansies, snapdragons, tomatoes, and herbs are perfectly happy in small containers provided a good planting medium is used which will drain well, but still retain adequate moisture.